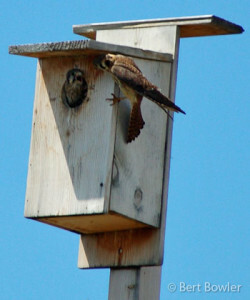 Preserve Steward Tom Mabbott spear-headed the project to install nesting boxes at three Door County Land Trust Preserves. The nesting boxes will give a safe nesting area to these birds that need open fields to hunt prey. Kestrel populations have dwindled over the past few decades due to the use of pesticides which make shells brittle and cause eggs to break prematurely. Open fields that have not been used for agriculture in recent years make wonderful nesting sites for the birds. Sturgeon Bay Utilities generously donated the supplies, equipment and manpower necessary to make this project a reality.